Hampshire – 2351 sq. ft. 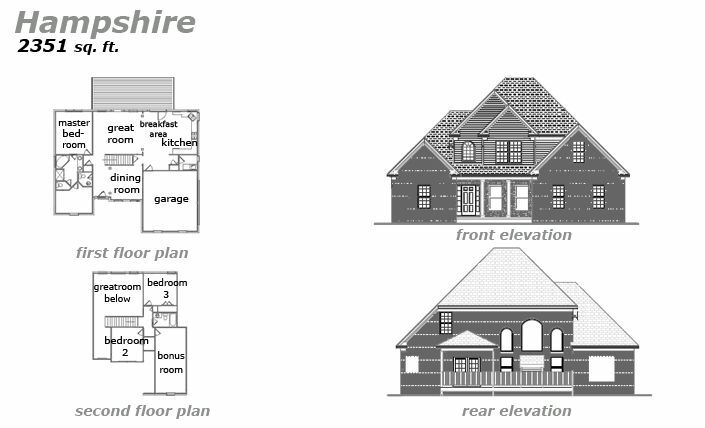 Magnificent 1 1/2 Story, 3 Bedroom and 3 Bathroom Estate just waiting to be built on your lot! The first floor is almost completely open, with a dining room, great room, kitchen with breakfast area forming a cohesive space. The Master Bedroom Suite has a large bathroom with Tub and Shower, plus a big walk-in closet. On the second floor, the remaining two bedrooms look out over the great room below, and there’s a large bonus room with a big front window.